Open farm land — this view near Albany — is protected by state planning law. A one-paragraph death notice in today’s Albany Democrat-Herald announced the passing at age 96 of Hector Macpherson, the one man who more than anyone else deserves the credit for saving much of the farm land and open space we still have in the more heavily populated parts of this state. Although he would later leave the party — he would probably say it left him — he served one four-year term in the state Senate as a Republican from Linn County, from 1971 through 1974. 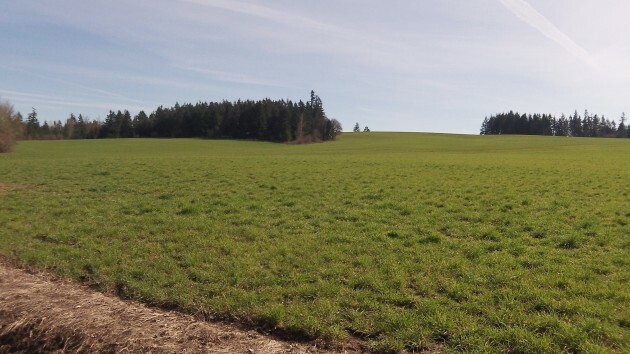 As the owner of a 180-acre dairy farm in Oakville at a time of tremendous population growth in the Willamette Valley, he had been concerned for years about the loss of farm land to development. And in 1973, he was one of the prime architects of Senate Bill 100, the Land Conservation and Development Act, which laid the groundwork for the elaborate system of land use restrictions Oregon has developed and expanded ever since. But the system has done what it set out to do. It has made sure that with some exceptions, farm land outside the urban growth boundaries of cities cannot be turned into housing tracts or otherwise paved over. As a result, cities in much of the Willamette Valley south of the Portland metro area don’t run into each other. There is plenty of open space and farm land in between, and that’s a good thing not just for agriculture but for the livabiity of the valley as a whole. Land use planning was not the only entry on Macpherson’s record of public service. He also supported Oregon’s first-in-the-nation bottle and bike bills in 1971, two other parts of the Republican leadership for livability during the era of Gov. Tom McCall. Senate Bill 100, though, did not make Macpherson popular in his Linn County district, enabling Democrat John Powell to defeat him for re-election in 1974. Oregon definitely needs more Macpherson’s and McCall’s! Of course, what Isaev did not know was that Houston had the least governmental involvement with land use of any major American city. Isaev confused what happens in the free market with what happens in governmental planning. “Russian Mayor Likes Houston,” AREA Bulletin (December 1975), p. 3. This little story illustrates that government “solutions” to land use serve the interests of government first and foremost. The prevailing attitude is that government has first claim on all land. The same is happening with personal income. Let’s be careful in praising anyone who advocates restricting, or eliminating entirely, the property rights of individual citizens. Having been in Houston more times than I can care to count since the early 1960’s, I can tell you it’s a lot better now than when you could barely breathe from the combinations of smog and fumes form the oil refineries that poured into the air. The Federal Clean Air Act began to change that, when it was enacted in eth 1970’s. Houston remains a mess. It has some nice areas like all cities but I doubt most folks would like living there. What is truly amazing is that you look to a stone-cold communist deputy-mayor of one of the most repressive and centrally planned political and economics countries that ever existed, as a source of wisdom. A country that destroyed all property rights, prohibited free speech, locked up people without trial and killed many millions of their own citizens in purges.